The Grimaldi Group has been the pioneer in the development of short sea shipping and particularly of the concept of the Motorways of the Sea in Europe. 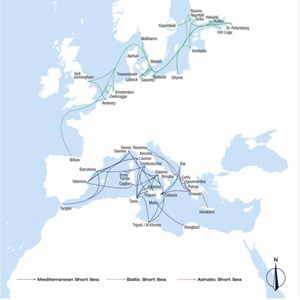 Following the incorporation into the Group of Finnlines and Minoan Lines, Grimaldi's Network of Motorways of the Sea was further extended, creating a bridge between the Mediterranean, Northern Europe and the Baltic Sea. The Grimaldi Motorways of the Sea are constantly expanding with a goal of offering an extensive network of fast, frequent, reliable and economically competitive maritime links for the transport of trucks, trailers, cars and other rolling cargo in the Mediterranean and North Europe. Ever increasing volumes of freight previously moving by road now opt for sea transportation as the natural alternative to the already congested motorways, thus promoting the EU's policy of shifting goods from the road to more environmentally friendly transport solutions. The Group deploys a modern fleet of cruise ferries, Ro/Ro-Passenger and pure Ro/Ro vessels to serve its Motorways of the Sea network. All vessels have large loading capacity for freight and offer great comfort for drivers and other passengers, making the journey a time of well-being. Some Motorways of the Sea received fundings by the "Marco Polo" European Programme.